Seeing references the last couple of days from poker people responding to something Jon Stewart said on The Daily Show earlier this week regarding online gambling in New Jersey. The Poker Players Alliance and others are mildly up in arms about what they’re saying was an unfair characterization of online poker by Stewart. However, looking back at the clip and statement, that itself sounds like an unfair characterization of what Stewart actually said. It came up as a short postscript to a segment not about online gambling or online poker, but rather about the issue of legalizing marijuana (on the April 20 show, natch) -- one you can watch on the Comedy Central site here. Amid that discussion, reference was made to New Jersey Governor and potential presidential candidate Chris Christie saying he is opposed to pot being legal, noting also how states allowing its sale are in conflict with federal law. Stewart’s response to that position is to bring up Christie having signed into law the online gambling bill back in February 2013 that opened up poker and other casino games to online players in New Jersey. Actually Stewart doesn’t bring it up specifically, but rather plays another clip from another news show reporting that. It’s obvious that while Stewart did evoke a long legacy of gambling being associated with other criminal activity -- including violence -- to get a laugh, he hardly “attacked online poker” as Rich Muny of the PPA has tweeted out (and which others are also saying). The point of the observation by Stewart is entirely muted by that response, actually. Rather than “attack” online gambling directly, Stewart is showing what appears to be an inconsistent position by Christie regarding the ability of states to pass laws that aren’t in accord with federal laws. 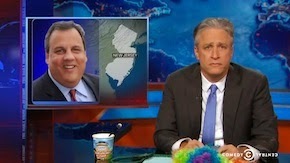 Christie allowed legislation in New Jersey that goes against the feds’ legal stance on online gambling, Stewart and The Daily Show are pointing out, which seems to contradict what he is now saying about individual states legalizing the sale of pot despite federal laws making it illegal. Those responding to this tangential reference to online gambling (and online poker) as though it were an “attack” are building it up into something it is not, thereby making it seem as though Stewart -- someone with a fair amount of influence -- is some kind of threat to the cause when he clearly isn’t. In order to reflect on the absurdity of allowing some forms of online gambling and not others, Stewart evoked Alaska senator Ted Stevens’ much-derided characterization of the internet as “a series of tubes.” Aided by some hilarious animation, Stewart explained how poker chips clog up the tubes whereas horses can run through them easily and lottery balls blow through them without a problem. When making that point about the inconsistency present in the bill being proposed (that would eventually become the UIGEA), was Stewart attacking gambling over the internet on horse racing and lotteries? Well, he wasn’t promoting those things, but he was hardly attacking them, either. In truth the observation implied support for online poker, although there, too, that would be reading something definite into the segment that was only implied at best. 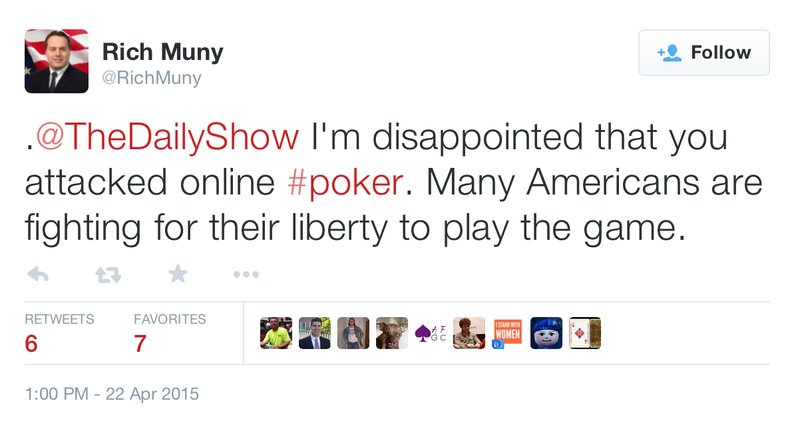 Stewart didn’t “attack” online poker this week. I don’t think it makes sense to attack him as though he did. Wrong. The state's legalization of online gambling does not go against federal law. The DOJ clarified its position many months ago in a letter. This is not up for debate anymore and the entire reason states are suddenly opening up legislation to legalize it. The real analysis should be why does anyone care what Jon Leibowitz says? Thanks, Clay. By "goes against" I'm just referring to legislation on the state level that doesn't correspond to federal law, not offering a legal opinion. Am aware of the DOJ letter -- actually from Dec. 2011 -- and how it opened the door for New Jersey and other states to pursue their own online gambling legislation.